Maintains crystal-clear pond water. Quickly clears cloudy pond water. Helps filters function more efficiently. Works by causing tiny suspended cloud particles in pond water to clump together. The clusters quickly fall to the bottom. Use Pond Zyme Plus or EcoFix along with Accu-Clear for incomparable pond cleanliness. Before using Accu-Clear, make certain that the pond has vigorous aeration via a fountain, waterfall or aeration device. During hot summer months, pond water contains very little oxygen. In sunlight, algae and submerged plants produce oxygen, and in some cases may be the major source of oxygen in the pond. However, submerged plants and algae consume oxygen at night. Organic matter also consumes oxygen while decomposing. When organic matter is removed by the filter or settles to the bottom of the pond, the oxygen level may drop to harmful levels if adequate aeration is not provided. Therefore, when using Accu-Clear during the warm summer months, adequate aeration is required to avoid fish death. Do not shut off pond pumps or aeration devices at night. Aeration must be provided for pond life at all times. 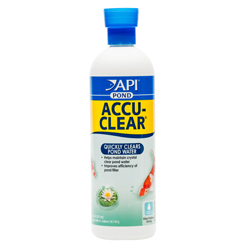 When used as directed, Accu-Clear is non-toxic to fish and plants. If adequate aeration is provided, oxygen levels will not drop to harmful levels.